Tetralogy of Fallot is a congenital heart defect—a problem with the heart’s structure that’s present at birth—that changes the normal flow of blood through the heart. Babies and children who have tetralogy of Fallot experience episodes of cyanosis, a bluish tint to the skin, lips and fingernails, which occurs because the oxygen level in the blood is below normal. Like many heart defects that occur before birth, the exact cause of TOF is unknown. Children with TOF may be more likely to have chromosome disorders such as DiGeorge syndrome. The heart consists of a right side and a left side, separated by the septum. The two sides are subdivided into two chambers. The upper chamber is called an atrium and the lower is called a ventricle. In a healthy heart, the right atrium receives blood from the body through large veins, the superior and inferior vena cava. The blood flows through the tricuspid valve into the right ventricle, which propels it through the pulmonary valve and into the pulmonary artery to the lungs. In the lungs, the blood picks up oxygen and loses carbon dioxide. Oxygenated blood then returns to the left atrium, where it flows to the left ventricle. The left ventricle sends oxygenated blood to the body through the aorta. Valves in the heart allow blood to flow in one direction and help maintain the pressure required to pump the blood. Blood carries the oxygen and nutrients that the organs need to work well. Blood also carries carbon dioxide (a waste product) to the lungs so you can breathe it out. What is wrong with a heart that has tetralogy of Fallot? Tetralogy of Fallot involves four heart defects. Ventricular septal defect: This is a hole in the septum between the heart’s two lower chambers, the ventricles. The hole allows oxygen-poor blood from the right ventricle to mix with oxygen-rich blood from the left ventricle. Pulmonary stenosis: This defect is a narrowing of the pulmonary valve—the passageway from the right ventricle to the pulmonary artery through which the blood travels to the lungs to pick up oxygen. In pulmonary stenosis, the pulmonary valve cannot open all the way, so the heart has to work harder to pump blood. As a result, not enough blood reaches the lungs. Right ventricular hypertrophy: The muscle of the right ventricle is thicker than normal because the heart is working harder than usual due to the narrow pulmonary valve. An overriding aorta: In a healthy heart, the aorta is attached to the left ventricle and delivers only oxygen-rich blood to the body. An overriding aorta is located between the left and right ventricles, directly over the ventricular septal defect. As a result, oxygen-poor blood from the right ventricle flows into the aorta instead of into the pulmonary artery. A child with TOF can turn blue around the lips or finger tips, especially during agitation or crying. A doctor may hear a murmur when examining the child. If a diagnosis of TOF is suspected, the child will undergo additional testing such as an X-ray and electrocardiogram. The diagnosis of TOF is usually confirmed with an echocardiogram or ultrasound of the heart. Tetralogy of Fallot affects approximately 5 out of every 10,000 babies. In most cases, it is sporadic and nonfamilial. It occurs more commonly in males than in females. While the cause of most congenital heart defects is unknown, prenatal factors associated with a higher incidence of tetralogy of Fallot include maternal rubella or other viral illnesses during pregnancy, poor prenatal nutrition, maternal alcohol use, maternal age older than 40 years, maternal phenylketonuria (PKU) birth defects and diabetes. Children with Down syndrome also have a higher incidence of tetralogy of Fallot. 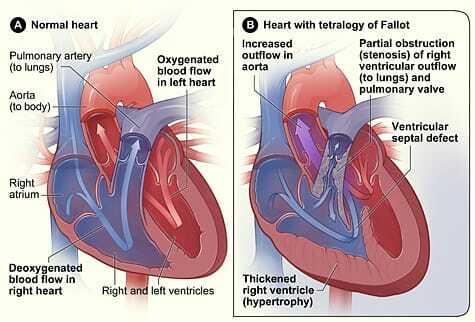 Tetralogy of Fallot is repaired with open-heart surgery, either soon after birth or later on in infancy. The timing of the surgery depends on how narrow the pulmonary valve and artery are. The only definitive therapy for children with TOF is with open heart surgery. While the exact timing of the procedure will depend upon the individual child’s condition, in general, surgery is undertaken between three to six months of age. Some newborn babies may have very low oxygen levels soon after birth and require earlier surgery. Not all babies can undergo full repair at this stage. Some babies will require a temporizing surgery to increase blood flow to the lungs and improve oxygen level in the body. After a few months of growth, the child will be brought back for definitive repair. Surgical repair of TOF includes closing the hole between the pumping chambers of the heart. In addition, the obstruction to the flow of blood from the right side of the heart to the lungs is relieved. The pulmonary valve is evaluated to ensure that it is of adequate size. Sometimes, the valve may be very poorly developed and will need to be cut out to ensure that it does not obstruct blood flow. What is the prognosis for children with Tetralogy of Fallot? The mortality rate in untreated patients reaches 50 percent by age 6. Over the past few decades, the diagnosis and treatment of tetralogy of Fallot have greatly improved. Most children who have surgery to repair this heart defect survive to adulthood with excellent quality of life.